¡Buenos días! With the most beds (128) and bars (3) of any party hostel in Krakow and catering to the 18-35 crowd, booking a bed at The Little Havana Party Hostel is an easy decision to make. Located in the heart of Krakow's Old Town, with our awesome rates our hostel is the best place to get crazy and experience all Krakow has to offer in a fully equipped, clean, fun, safe and exciting party hostel. Opening in 2015, our party hostel (sponsored by Havana Club) has a cool colonial style decor to help you relax in between parties and sightseeing engulfed in the warm Caribbean vibe. Why only visit Krakow when you can visit Krakow while on a trip through tropical Cuba? Please help support our super low rates for such a nice and modern hostel with your patronage at one or all of our bars. And thanks to our Havana Club sponsorship, we are able to offer great bar prices, with beers only 5 PLN (that's cheaper than anywhere in Krakow). We ar located smack bang in the middle of the old town, right off Krakow’s famous market square (less than 100 meters) and 50 meters from the main party street (Szewska). There are hundreds of awesome bars, pubs, clubs, restaurants, cafes, shops, and services within a very short walk from the hostel. Getting to the hostel is easy as pie as well, as it is just a 12 minute walk from the train/bus station or a short tram ride. To get the tram, after you get off the bus or train you have to walk through the shopping mall 'Galeria Krakowska'. Once you're outside look for tram's #2 #4 #20 and get off at 'Teatr Bagatela'. From there, it's a short 2 min walk up Szewska street, take your first right on Ul. Jagiellonska and look for either the Papitos, Teatro Cubano or Little Havana Party Hostel sign at the street number 10. Our hostel is situated above the two bars Papitos and Teatro Cubano and is the second door along after the entrance to Papitos. We are a short walk from all of Krakow’s most famous clubs including Shakers (30 seconds), Frantic (30 seconds), Prozak (5 minutes), and LOKAL (4 minutes). We know one of the keys to a good stay is a friendly and helpful team. We have a mix of amazing locals and like minded travellers who know the city well and especially its nightlife to help guide you to whatever you might be looking for. If you ever have any issues, please ask a hostel team member and we will try our best to help solve it. Especially since we are continually looking for ways to improve as a hostel, your comments will only help us to help you and future guests have a great stay. Our staff will also help you pick the best tours and book them for you. Recently renovated yet retaining some of the historical building elements, The Little Havana Party Hostel strives to keep everything spick and span. With 24 hour reception, lockers, key cards, cameras in all public places, recorded monitoring, and the newest technology in fire safety, you can sleep rest assured you and your belongings are safe at The Little Havana Party Hostel. 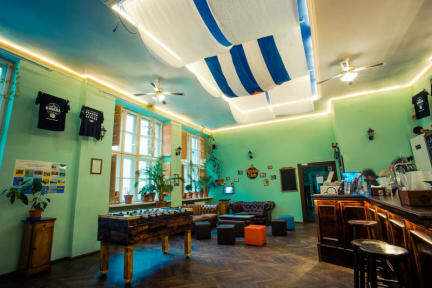 - 3 BARS: Fully stocked Cuban styled bars in the building; 1 at the common room and 2 connected to the building with special access for hostel guests. - PROJECTOR: 2 projectors, including a 4 meter projector downstairs at Teatro Cubano to feel like you are part of the most important matches! - FOOSBALL: The only hostel with a professional foosball table - and it’s free with a ball deposit! - KITCHEN: Fully equipped brand new kitchen and guest fridge/freezer. - REAL MATTRESSES: These aren’t the ancient foam boards you will find at other hostels. Sleep comfortably on our brand new real thick mattresses. - TOWELS: Rent a fresh towel! - READING LIGHTS: We have ones that actually work! - FREE PRINTING: Print up to 3 pages for free. - FREE MAPS and GUIDES: Pick up your where2B Krakow Nightlife Guide at the reception. - LAUNDRY SERVICE: Dont hassle with your washing our reception can take care of it for you. - WALKING TOUR: Free walking tour pick up in the common room every day at 10:40am. PUB CRAWL: 2 ways to pub crawl! - Unlimited Crawl: For 49PLN get an hour of power of UNLIMITED BEER, HAVANA CLUB RUM, VODKA, GIN, SOFTS and entry to 4 of Krakow's best clubs, drinking games with crazy but still professional party guides and to top it off a free welcome shot at every club. WARNING: We do not condone alcohol abuse and you are solely responsible for yourself and any destruction your drunk a** might cause. FOOSBALL TOURNAMENT:Get partner up with a random guest and try your luck to become the champion and win a Havana Club Cuba Libre plus a free cultured crawl! TRIVIA NIGHT: See how smart you really are team with some other travellers. Every day we offer our guests on free or very cheap activates that range from going cliff diving and swimming in the lake to taking a stroll down to the Jewish Quarter and going to Schindler's factory. Below Is just a short list of some of the activates. Cliff diving and swimming at Zakrzówek lake. TOURS: No trip to Krakow would be complete without a visit to the Auschwitz Memorial. Recently the museum has changed their policies and the number of available guided tours is extremely limited. To ensure that you are able to visit Auschwitz, contact us as soon as you know the dates you will stay to book your tour with us. Our staff will help you book all the most popular tours in Krakow including Auschwitz, The Wieliczka Salt Mine, and Krakow city tours, student discounts available. We can also book the shooting range, paint balling, go-carting and bungee jumping!! The best pub crawl ever!! Cheap ticket for all you can drink alcohol at hostel's bar, and heading to several amazing club with nice atmosphere. Once you choose the party hostel, you should definitely join the pub crawl at night, since you couldn't get good night sleep for they party overnight downstairs. The staff in of the hostel are helpful and friendly, organizing games which makes the atmosphere warm and welcome. The first day reception is helping and attentive. But when some situation happens, the staff on duty that day was try to help but so irresponsible for their words, their promise was to solve the problem within 2 hours, but turned out to finish in 8 hours(just because forget to tell his colleagues). Gladly I don't have a plane to catch at that time, just move to another hostel nearby, otherwise it's really a disaster. I feel very disappointed about irresponsible promise.